Its been a while since I've posted. I've been concentrating on other projects so I am saving posts here for the really special foods. I just got back from Haiti. There is a restaurant called Epi d'Or that I called the Haitian Subway. In reality, it is much more than a Subway. They serve sandwiches but they also serve cakes, pastries, pizza and beer. 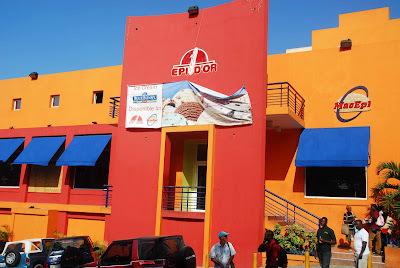 I went to two different Epi d'Ors in Haiti and both had heavily armed guards standing outside. On the last night I was in Haiti our group split a 'steak sandwich.' It is Haiti in a microcosm. There is no steak in this steak sandwich. Just like when you order a turkey sandwich, you get ham and they call it turkey. Its all good. 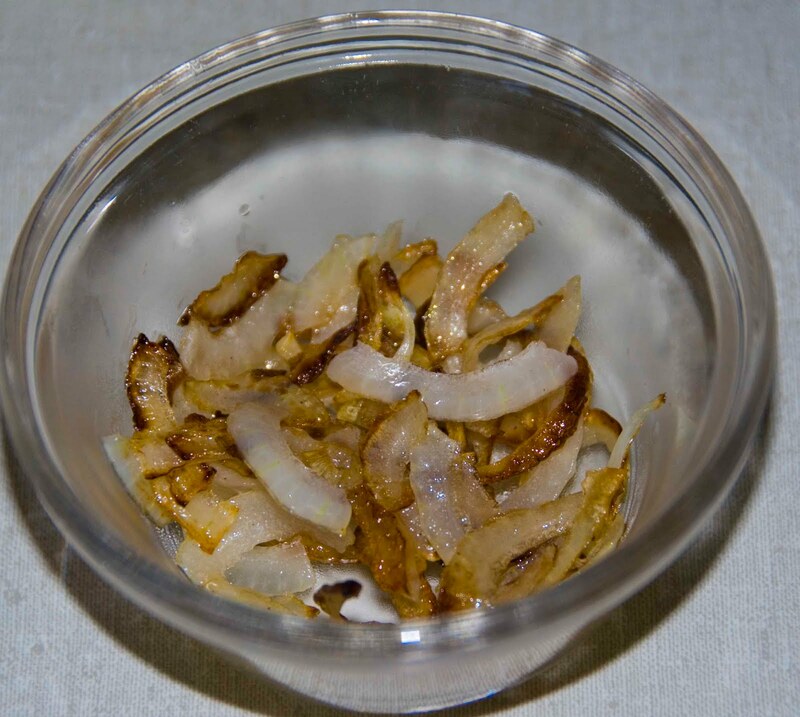 It was so delicious (maybe because I had been living on rice and beans for a week) that I decided to dissect it for home consumption. As you can see from the photo, it consists of ground beef, onions, and white cheese. The beef was seasoned with a tiny bit of oregano, pepper, cayenne pepper, salt, and tomato sauce. 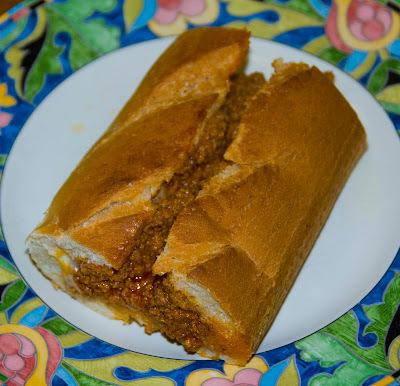 The hogie roll was your typical loaf of Haitian bread, which is a lot like French bread and very similar to my recipe for Cuban bread, only shaped more like a baguette. The outer crust was soft. To make it at home you have to get 1/2 pound of ground beef and brown it in some water. I used water because the particles in the sandwich were very fine. 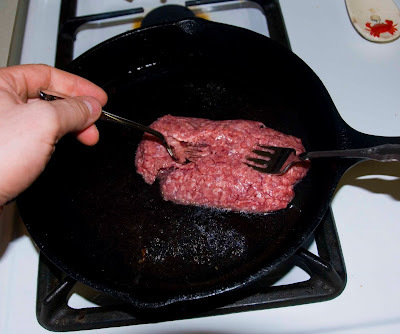 If you use 2 forks to mash up the meat in the water, it will end up with a very fine texture. To the meat add: 1 t salt, 8 oz tomato sauce, 1/2 t oregano leaves, 1/2 t ground pepper, 1 clove garlic (minced) and 1/4 t cayenne pepper. If you like it really spicy, add more cayenne. I had to leave it out because I was sharing the sandwich with a 1 year old and a 5 year old. 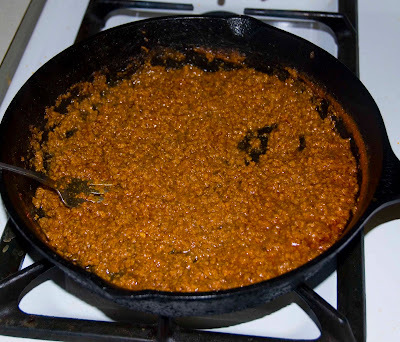 Bring the mixture to a brisk simmer and cook, uncovered, until the liquid is mostly gone. Slice the top of a loaf of French bread down the middle and scoop out most of the white bread. Drop some provolone cheese in the bottom and sprinkle the onions over. Place your meat filling on top of the cheese and onions. Wrap the roll in tin foil and place in the oven at 300 or so for a few minutes until its nice and warm. 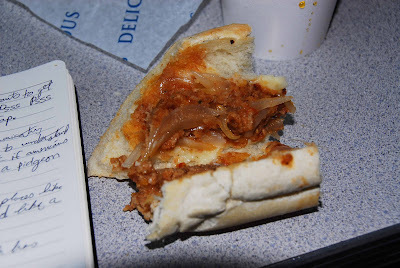 My sandwich had the right flavor but I had to change the ratio of meat to onions a little bit. My brother also shared the sandwich and he hates onions. The next time I make it, I will put WAY less meat in the sandwich and WAY more onions.